Prometheus Had It Easy: I Need a Little Help and There Is Money Involved - AutoNetTV Media, Inc. According to Greek mythology, Zeus was really mad at the titan Prometheus for giving fire to mankind. As punishment, he had Prometheus chained to a rock and sent an eagle to eat his liver. 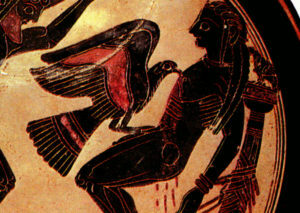 Making it worse, Prometheus’ liver would heal every night, and the being eaten alive thing started over every morning. OK, maybe my problem isn’t as bad as that – but thinking about it does make my liver hurt a little. Here’s the thing – did you know that AutoNetTV publishes over half a million articles on websites every year? There are two pools of articles from which our systems select a weekly article at random to be published on the websites of about 10,000 automotive service center subscribers. They use the articles in social media, in newsletters, and as customer education information for recommended or declined services. So the libraries have 730+ articles in them – and I have to write about 120 new articles every year. You starting to see the Prometheus thing? I’ve got to come up with a lot of NEW material every month to stay on top of this. Yeah – I could use a little help. If you’re a motorist, what are some things about the automotive world that you would like to know more about? Services, repairs, safety, technology, saving money, history, the future, training – whatever. If you’re an automotive professional, what are some of the things that you wish civilians knew – stuff that they should read on your Facebook page or Twitter feed? To show you I mean business, I’m going to put all the ideas into a bucket and select an entry at random. The winner will receive a $50 VISA gift card. The more suggestions you make, the more chances you have to win. 50 bucks! You could buy liverwurst sandwiches for the whole family! Sorry, that was in poor taste. Leave a comment or send us an email at videos@AutoNetTV.com.